In 1988 Australia celebrated 200 years since the arrival of the First Fleet. Captain Arthur Phillip led the party of 11 ships to the founding of Sydney and the colonisation of New South Wales. Arriving between 18-20th January 1788 1,487 men, women, children and convicts landed to establish the first European colony in Australia. 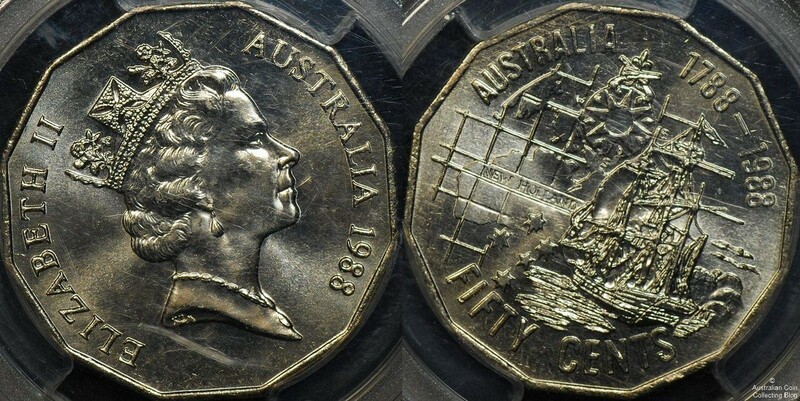 There were many events around the country planned for the Bicentenary in 1988 including a 50 cent coin released into circulation by the Royal Australian Mint. This dodecagonal (12 sided) 31.51mm copper (75%) nickel (25%) coin weighed in at 15.55 grams with a plain edge. The reverse depicts an uncharted map of New Holland (Australia), the stars of the southern cross and a ship of the First Fleet. This coin is often nicknamed the “Tall Ships” coin when found in change. It was designed by Michael Tracey. The standard obverse for 1988 was the Raphael Maklouf portrait of Queen Elizabeth II, the last year this portrait was used. 8,998,800 of these coins were released into circulation in 1988. They also feature in the Masterpieces in Silver issues of 1988 and 1989 in sterling silver proof, the 1989 issue being a 1989 dated 50c. Mint and Proof year sets for 1988 also feature this Tall ships coin. A one dollar was also released for the Bicentenary in 1988.